This is a question that many people ask when they see images of coastal cities in the throes of a “water scarcity” crisis. In 2018, the City of Cape Town garnered global attention for its water scarcity woes. The city was projected to run out of water completely in early 2018, and it took a combination of drastic measures — severe water restrictions and rationing to avert the crisis. Yet Cape Town is in an area surrounded by not one, but two oceans — the Atlantic and Indian Oceans. How can a city that has two of the world’s largest oceans on or near its coastline ever run out of water? And then consider California. About 910 miles — 44 percent of its total linear border distance of 2,060 miles — is a coastline that runs along the Pacific Ocean. Fifty-five percent of California’s population lives in 16 coastal counties that border the Pacific. Yet for years, California suffered a terrible water scarcity problem. Water emergencies were declared all over the state, even in coastal cities like San Francisco and Los Angeles. Are There Different Types Of Water Scarcity? Let’s take three cities in California — San Francisco, Los Angeles, and Sacramento. San Francisco and Los Angeles are coastal cities. They are bordered by an inexhaustible supply of water — the Pacific Ocean. Sacramento, on the other hand, is more than 80 miles inland. Most of its water supply comes from the American River and Sacramento River — water sources that are susceptible to drought. If there were no economic or technological limitations to where cities could source their water from, such that using source water from rivers, lakes, streams, groundwater, and oceans was fair game, which of these cities would be affected by a drought? In other words, which of them would have real water scarcity issues? Surely, only Sacramento could have a real water scarcity problem. Certainly, San Francisco and Los Angeles, two coastal cities, cannot claim to have the same water scarcity issues as Sacramento, an inland city? In a world where the technology for treating ocean water exists, and where there are no economic (pricing) limitations to pay a fair price for the treated water, coastal cities would theoretically never have water scarcity issues. There is about 1.5 billion km3 of water in the oceans. The average person needs just about 30 gallons per day of water, and there’s enough water in the oceans to provide 50 billion gallons per day for each of Earth’s nearly 8 billion people! Water Scarcity — A Technology Issue Or A Price Issue? If coastal cities have a form of water scarcity that is not due to an absence of water supply, then surely we must call what they experience an artificial scarcity. Economists describe artificial scarcity as the shortage of items that occurs even though either the technology, production, or sharing capacity exists to theoretically create a limitless abundance. In Cape Town and California, the water scarcity issue had been caused by a drought. Yes, there were no rains and the rivers and reservoirs that brought freshwater were dry. But was water truly “scarce”? After all, both locations are situated close to some of the largest oceans and waterbodies in the world. Couldn’t Cape Town or California have turned to the oceans around them for water when their freshwater sources dried up? The answer is yes. Both locations could have turned to the oceans as a water source. So, why didn’t they? There are no regulations banning the use of ocean water as a drinking water source. The technology for treating ocean water has existed for decades. The only problem is that of price. Water is cheap. Drinking water that is sourced from freshwater sources, like wells, rivers, lakes, and streams, is cheap. Dirt cheap. Water that is sourced from oceans is more expensive to treat. So, while it might be abundant, it is not affordable at the current prices. Why does the price of water potentially serve as a cause for the (artificial) scarcity of water? To answer that question, we must compare the relative costs of treating sea (ocean) water and freshwater. The major difference between freshwater and sea (or ocean) water is the level of salt. Freshwater from lakes, rivers, streams, snow-melt, and precipitation typically has less than 0.5 parts of salt per thousand. That means you will find less than 0.5 Ibs of salt in every 1,000 Ibs of freshwater. In percentage terms, that is about 0.05 percent. Saline waters in oceans and seas have about 100 times more salt than freshwater, i.e., up to 5 percent of the water can comprise of salt. Even human sweat tops out at less than 1 percent salt content, only 1/5th of the salt in the oceans and other saline waterbodies. Drinking water typically has just about 0.01 percent salt. Getting to the low level of salt required in drinking water is easier from a freshwater source that starts out at less than 0.05 percent salt content, than from sea or ocean water that has about 3 to 5 percent salt. Freshwater sources usually don’t require any special processes to remove the salt content. Treatment is relatively simple, comprising of sedimentation and filtration to remove solids and suspended materials. Treating seawater or any type of water with a relatively high salt content usually requires the use of desalination technologies that allow for the removal of salt. Salts are dissolved in the water, and the technologies that exist for desalination involve either trying to get the water separated from the salt by heating up the water so that it evaporates and leaves the salt behind, or by applying high pressures to the water so that the salt molecules are forced across special membranes that separate them from the water. Either approach requires energy — lots of it — and specialized equipment. A drinking water treatment plant using freshwater as a source is a simple place — with mixers, some chemicals, and typically a sand filtration system. A desalination plant on the other hand is a true chemical processing facility, complete with decant systems, sedimentation tanks, membrane filters, ion exchange resins, evaporating tanks, heat exchangers, reverse osmosis units, energy recovery systems, and remineralization systems. This translates to higher costs for desalination. In a comprehensive review of prices in California, desalination costs were estimated to be about $4/m3 while water treated from traditional freshwater sources averaged about $1/m3 in costs. This up-to-4X difference in costs is what makes it difficult, at least with current pricing structures, for utilities and cities to actively consider using sea and ocean water as a reliable drinking water source. About 40 percent of the world’s population lives within 100 kilometers of the coast, so solving the coastal water access problem resolves much of any future global water scarcity problem. In economics, the price of a good is usually set by the marginal cost of the supply source that clears the market demand. For water, the supply source that satisfies all possible market demand is seawater. 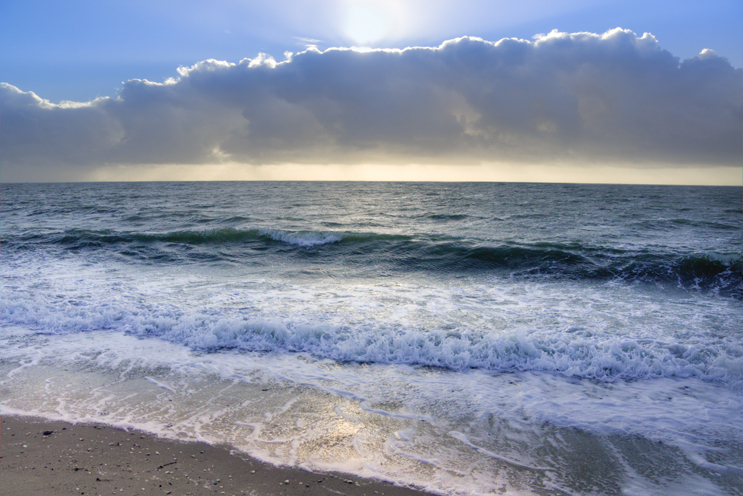 The oceans hold an almost inexhaustible source of water — enough to provide about 50 billion gallons per person per day! To put that number in context, all of the water used in the U.S. on a daily basis is just about 40 billion gallons per day. The treatment cost for seawater (i.e., desalination) is therefore the minimum drinking water price that will allow for its use as a strategic and viable water source. If water prices were to rise to about $4/m3 ($15 per 1,000 gallons), the reluctance to utilize seawater as a drinking water source will abate. However, it will mean that the per capita cost for water usage (at 50 gallons per person per day) will increase from current values of about $70 per capita to $280 per capita. For a household of four persons, this amounts to an increase from about $300 per year to $1,100 per year in drinking water related costs. Add to this sewage treatment costs, which tend to be about $300 to $400 per year, for the average household, and the water related costs — both sewage and drinking water — would then come to about $1,500 per household per year, or about $350 to $400 per capita. Getting consumers to agree to such a price increase is very difficult, if not impossible. Water pricing is absurd. Consumers are willing to fork out high prices for bottled water, paying as much as $1.22/gallon (i.e., $1,220 per 1,000 gallons), while average drinking water prices come to about $8 per 1,000 gallons — a 150X difference. In fact, bottled water prices are still a whopping 80X larger than the “high price” of $15 per 1,000 gallons being recommended to cover the costs of desalination. There are several reasons why drinking water is not fairly valued, which I have argued elsewhere largely comes down to the water industry’s inability to effectively communicate the value of water. The marketing challenges that utilities have in communicating the value of water, and the political reticence that comes from increasing prices on a good that people see as a right, makes water prices one of the most stagnant of any category of goods. The solutions to this problem aren’t easy or straightforward. Coastal water scarcity cannot be solved if water prices don’t increase. Water prices cannot increase until the water industry resolves its marketing challenge with the effective communication of the value of water, and unless a way is found to protect consumers in the lowest income categories. Local governments must also be shielded from the political fallout that accompanies water price increases. The political angle is important and ranks alongside marketing as one of the major reasons why water pricing is stagnant. Incorporating recycling or desalination as a strategic option for water sourcing requires a long-term view that does not fit in nicely with the two- or four-year terms of political officeholders. If left to local politics, it is easy to punt the problem to the next term. Some federal policy interventions might be needed. For instance, if everyone in the U.S. paid for drinking water at the rate of desalination, it would cost a maximum of about $67 billion more per year. If this increase was covered via a nationally levied tax, this would amount to a 2 percent increase on a tax base that returns about $3 trillion per year to the federal government. Monies raised from this “Water Security Tax” or “Climate Change Resiliency Tax” or whatever softer euphemism we choose to call it, can then be sent back as subsidies to the communities that require the assistance for building desalination infrastructure. Tax rebates from the levied pool can be used to subsidize the lowest income households. For those who wonder why inland cities and states should be forced to carry a tax burden on an issue that mostly affects coastal states, the full picture is that freeing coastal cities from the burden of finding pristine freshwater sources would make more freshwater available inland. For instance, much of southern California gets its water from aqueducts that transport water from the Colorado River. If ocean water became a viable source, then Southern California could potentially be served by coastal California cities — freeing up the Colorado River to cater to the needs of inland states like Utah, Wyoming, Nevada, Colorado, and New Mexico. A nationally levied tax is just one idea. Innovations that will drastically reduce the cost of desalination technology or allow for the recovery and reuse of the energy and materials utilized in desal treatment are another longer-term option. There will undoubtedly be many more solutions that we can come up with that would enhance the value of water, raise the readiness to pay, and allow us to eliminate the artificial scarcity of water. What are some ideas at you think can work?